To much fanfare the MacBook Pro was released. Then to much disillusionment its biggest limitation became clear: that it has a 16GB RAM ceiling on all of its models. To put more than 16GB of fast RAM into a notebook design at this time would require a memory system that consumes much more power and wouldn’t be efficient enough for a notebook. I hope you check out this new generation MacBook Pro, it really is an incredible system. The Intel chipset being used supports the following kinds of RAM: DDR3 RAM, Low Power DDR3 RAM (LPDDR), and DDR4 RAM. However, LPDDR3 only goes up to 1600 megahertz in speed, but Apple uses 1866Mhz 2133MHz RAM. How is this possible? That is because there yet another RAM standard, known as LPDDR3E (E for enhanced) RAM, that does go up to 1866Mhz. All DDR3 memory types are restricted to 16GB. LPDDR4 is not supported by Intel’s CPU, and the DDR4L (another low voltage RAM type) standard is not finished yet. So desktop class memory (plainly spoken DDR4) would be the only option if they wanted to go past 16GB. So then the question would be: How much power are they really saving by using LPDDR3E memory over the DDR4 memory they could have used which is supported by the very same CPU? The short and very rough answer is that under normal conditions the RAM uses 1.5 watts as it is, and if it were using DDR4 memory it would use about 3-5 watts. That would be about 20% of the overall system power usage to use DDR4 RAM, vs a bit less than 10% of overall power usage by LPDDR. This can be seen by placing the system under a normal load, using the excellent iStats menus to see exactly how many amps the RAM is currently using, then using a simple calculation to get the wattage being drawn by the RAM. In this case it’s using 1.49 amps, at 1.2 volts = 1.8 watts of power draw. Since the same cannot be done for testing units with DDR4 RAM, since no MacBook Pro uses that, we need to rely on testing of DDR4 from people from the PC world. First, it’s important to note that despite claims to the contrary, the difference of power draw between DDR3 and DDR4 is almost negligible. (Even though both those articles are making the point about how little difference LPDRR memory makes, both of them are making this comparison when comparing much higher powered setups and in some of the cases they were comparing desktop class machines using LPDDR vs DDR. It’s the raw numbers that are important for our use case, and the raw numbers show that DDR memory uses 2-3 more watts than LPDDR memory). It’s impossible to get an exact figure on it, but depending on the usage it can be estimated that between 2 and 5 watts are saved using LPDDR3E RAM instead of DDR4. And since the system averages to drawing about 20 watts on battery in normal usage, this can be said to be the difference of the RAM using 2 watts versus 3-6 watts for DDR4. Translated to overall power usage that would make the difference of 10% of power being dedicated to RAM versus the 20-30% it would be for DDR4. It is important to mention that that was a very conservative estimate because it’s not taking into account something which is difficult to calculate in real world usage: After RAM is used, a lot of the energy is wasted in the time it takes to go back into sleep mode and results in background power draw. This leads to an overall decrease in efficiency that does not tend to show in power performance tests, but is estimated to be about 50% of overall power draw on an average system when using DDR4 RAM, and in contrast it is 20% of the overall power draw when using LPDDR3. Considering that a 76 watt-hour battery is used in the 15 inch machines, they could have made the battery 30% bigger to hit the ceiling imposed by the Federal Aviation Administration, and they still wouldn’t have had the same battery life as they do now by using LPDDR memory. As the equation illustrates, a Mobile DRAM device that does not use PMMs consumes an average of nearly five times more power compared to a device that does use PMMs. The preceding example indicates how power is calculated for a particular Mobile DDR SDRAM device under specific system operating conditions. Power consumption for a given Mobile DRAM device can vary greatly, depending on how the system accesses the memory in standard operating modes and how the PMM features are used. PMM is the most powerful power saving feature of the several significant power saving features of LPDDR. Another favorite is that before the computer sleeps, the memory that is in use can be consolidated into as few physical chips as possible so that the others can be completely powered down. Apple have been using LPDDR for several generations of their notebooks, and it’s part of the way that they get very long standby time on them. Switching to DDR4 would drastically decrease it from the 30 days of standby time that they get now to less than one week. With DDR4 they’d have produced a notebook that would have a completely drained battery if it was at 50% charge and you closed the lid and left it for a few days. Not only would that be annoying, but by running the battery flat often it would end up damaging a percentage of their batteries because they’d frequently get 100% discharged, which puts a lot of stress on them, and sometimes even kills them. At Apple’s scale even if 0.1% of people suffer from an issue, it becomes suffixed as a “gate”, to indicate that it’s a scandal on a massive scale. Apple then get huge numbers of upset customers. If Intel had decided to support LPDDR4 then it seems clear that Apple would have used it. The iPhone 7 does use LPDDR4 memory, since it uses Apple’s custom ARM CPU which supports it. LinusTechTips attempted to do an analysis on the extra power that would be required to support more RAM, but unfortunately it has the fatal flaw in that they only compare DDR4 (16GB) to DDR4 (32GB), making their results mistaken. Which is surprising, usually it’s a high quality information source. In my last article on this topic where I mentioned that the FAA ceiling would have prevented Apple from including DDR4 RAM while maintaining decent battery life even if they wanted to, there was quite a backlash, with claims that it must be easily supportable because of other laptops being out that do support it. I went through these laptops which support memory greater than 16GB and found what you would expect: That aside from pay-to-play reviews, all of them do suffer from big restrictions in terms of battery life. “The battery life results we pulled from Dell’s XPS 15 are about what we expected. In the Battery Eater test, the XPS 15, with its potent graphics and CPU processing engines and 15-inch 4K display, has a lot to keep powered inside its light 4.4 pound frame. As a result, in this flat-out stress test, which spins cooling fans up to audible levels (more on this shortly), it peters out after just an hour and a half. Why did it only have 8GB of RAM, when it had high specs of everything else? it’s because it’s only occupying 1 of the 4 DIMM slots – they are only using 1 RAM chip, which decreases the available bandwidth of the RAM, in order to conserve battery life by only using 1 stick instead of the standard 2. Just continuous web surfing, without even switching applications, does not mimic real-world usage of a pro laptop. Most of the RAM would have been inactive for the duration of the test. The Lenovo ThinkPad T460 is, physically speaking, more of an apples to apples comparison, as it is also a light and thin machine. This has up to 32GB of RAM, and it has a decent battery life by most accounts. However if you dig deeper it only comes with a weak processor, an Intel® Core™ i7-6600U Processor with only 2 cores. These are typically mobile processors, not used for serious pro laptops. So this comparison isn’t valid. Apple used to make a 17 inch MacBook Pro, and it was discontinued because it didn’t sell well enough. Personally I had the 17 inch, and I would always have the most powerful machine I could get my hands on. Even if it weighed 10 kilos and cost $10k I would still buy it. But I recognize that I am not their target market. Overall, the market has spoken with its wallet, and in terms of sales volumes the thinner and lighter notebooks have steered Apple down this path. (To show you exactly what I mean in terms of personal needs, besides my usual work of mac data recovery software, I recently rendered a music video in HD using a neural net called Style app. Due to the 16GB RAM limitation it took several days and wrote 20.44 Terabytes to my drive in swap space (yes, over 20,000 gigabytes). This would have been an order of magnitude faster on a system with 32GB of RAM). Apple have never made big compromises in their engineering, and to switch to DDR4 memory now just to support 32GB would be relatively absurd given the disadvantages which are outlined in this article. They would be more likely to replace the Intel CPU with their in-house manufactured ARM CPU in order to support LPDDR4, or to wait for the LPDDR4 spec to to get completed which would make 32GB & up more practical. 1. An error in the details: The MacBook Pro uses 2133MHz RAM, not 1866MHz as stated at the top of this article. 2. An omission in this article: Not only would support of 32GB require usage of desktop class DDR4 memory (and come with all of the issues described above), but it would also require a different logic board design. The article is nice but not entirely accurate. 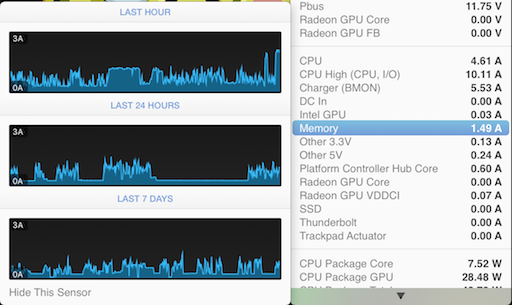 The MacBook Pro uses 16GB of very fast LPDDR memory, up to 2133MHz. To support 32GB of memory would require using DDR memory that is not low power and also require a different design of the logic board which might reduce space for batteries. Both factors would reduce battery life. Thanks, Phil Schiller, for taking the time to point those things out.